OK, if you missed the article about me and Joe Bonamassa, have a little look back (partly because I love mentioning it). Essentially, Joe has been my guinea-pig as he received the prototype of a new Haze Guitars model: the Blue Collar. The Haze Blue Collar is a stripped-back, no-nonsense guitar, designed to rock in the most workmanlike manner. No bells, no whistles, just a couple of nice chunks of wood and a beefy pickup. This is old-school. I thought I'd step you through the making of a Haze Blue Collar. My assumption (possibly flawed) is that everybody is as much of a guitar geek as I am and is therefore interested in seeing vaguely guitar-shaped pieces of wood get nails hammered into them. If that sort of thing doesn't interest you, I don't know what's wrong with you but you're weird. This is how it all begins. A couple of chunky pieces of ash. This being an instrument of pretty straightforward construction, I like to select timber with a bit of an interesting figure or grain-pattern. Unadorned doesn't need to mean unattractive. The Blue Collar has a 2-piece, book-matched ash body. Here, the two wings are centre-jointed to form the body-blank. This wood has some nice, dark streaks of sap-wood peeking through at the edges and even a little flame. Pretty. Once jointed, the actual shape of the body is drawn and the blank is cut approximately to shape on the band-saw. It's taken to its final shape with the router against a pre-made template before being tidied up on the spindle-sander. Then it's back to the router to round-over the edges (where appropriate) and to cut the pickup and control cavities. The neck pocket is also cut but this is complicated slightly as the wrapover tunomatic bridge that will be used requires a slight neck-angle. 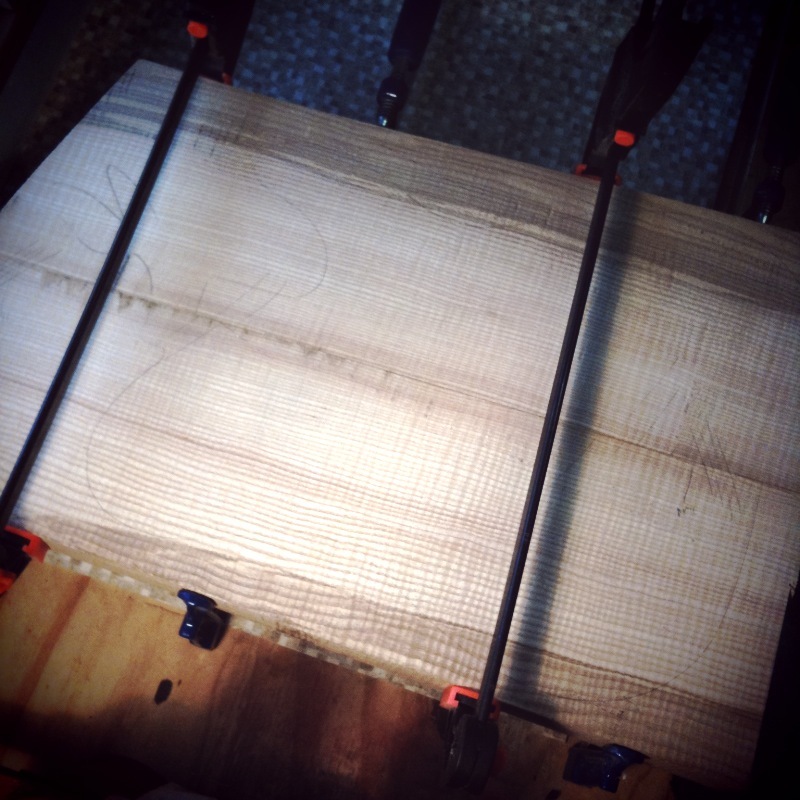 Routing for the neck cavity is done at an angle of 2.5 degrees to introduce back-angle when the neck is installed. This sort of neck angle is a little unusual on a bolt-on like this but it accommodates the chunky tunomatic bridge and feels pretty comfortable. It avoids silliness like recessing the bridge or installing the neck in a shallower pocket (to the detriment of tone). The eagle-eyed reader will have spotted my note to myself on the face of the guitar. After a realising a couple of times, during assembly, that I'd forgotten to leave access for a string ground wire, I now tend to leave myself a little reminder to do it as soon as I drill for the bridge. It's not a big deal to do it later but I prefer to get any drilling done before finishing happens. Here is the partially complete Blue Collar body resting on a couple of other in-progress bodies. Guitars to be.